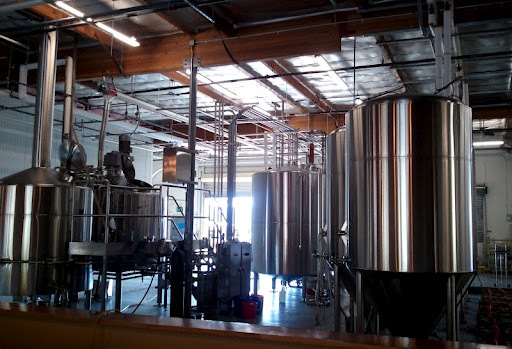 Last Friday, after a nice bowl of ramen at Yakyudori, we headed a few blocks down Clairemont Mesa Boulevard to stop in at Societe Brewing Company. 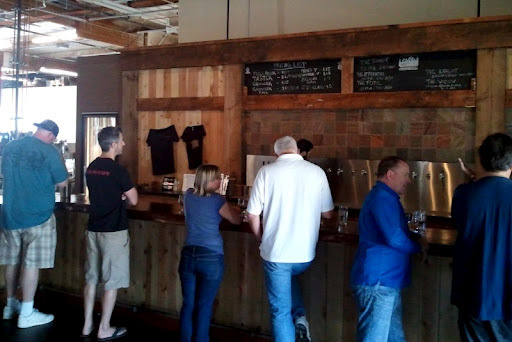 They haven't officially opened yet (the grand opening is this weekend), but their tasting room is open Wednesday-Sunday and their beers have started popping up in the more respectable drinking establishments around town. 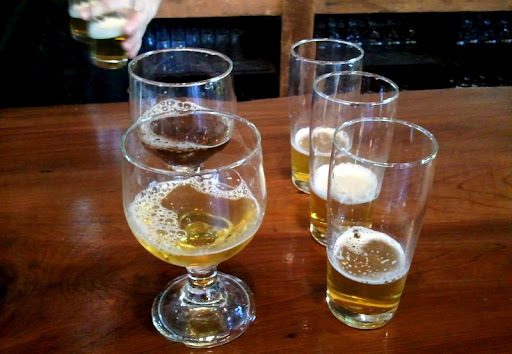 We bellied up to the nice wood bar and tasted a flight of the beers they currently have available. On the right are their three IPAs - The Dandy, The Apprentice and The Pupil. On the left are their Belgians - The Harlot and The Widow. 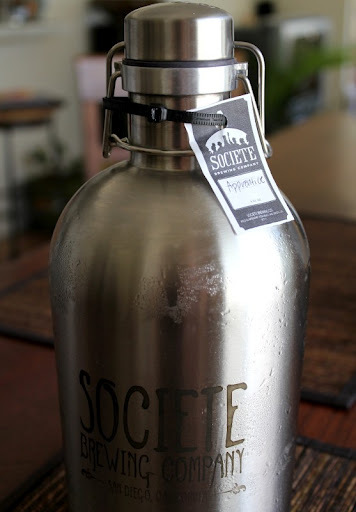 Societe's IPAs are solidly in the version of the west coast style I love - light in color and body and very hoppy, but emphasizing aroma over straight bitterness. They remind me of Alpine and Russian River. And that is a very good thing. 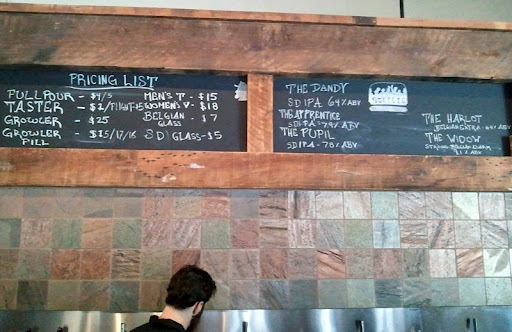 The Dandy, at 6.4%, has the lowest ABV of the three IPAs, but it still packs a nice flavor punch. The Apprentice is targeted at the center ABV spot, but it apparently came out stronger than expected. When we first had it at the Tap Room, I believe it was listed at 8.8%. They are gradually bringing the alcohol level down to where they want it. The Pupil is the hoppiest of the IPAs - so much so that it has a bit of a green tinge and a touch of astringency. Very good beer, but I think I prefer the Apprentice. On the Belgian side, The Harlot is a nice, drinkable Belgian Pale. We first had it at Cali Kebab's new Pacific Beach location and it was a perfect match for a sunny evening sitting outside. The Widow, a Belgian Dark Strong Ale, is a very nice version of that style - nutty and raisiny without being too sweet or boozy. We're looking forward to getting this guy refilled on a regular basis. We finally decided a few months ago that our old Charbroil grill's life was at an end. It wasn't a bad grill - it lasted us for almost ten years - but it was falling apart, and trying to fix it would cost as much as replacing it. So, a new grill it was. 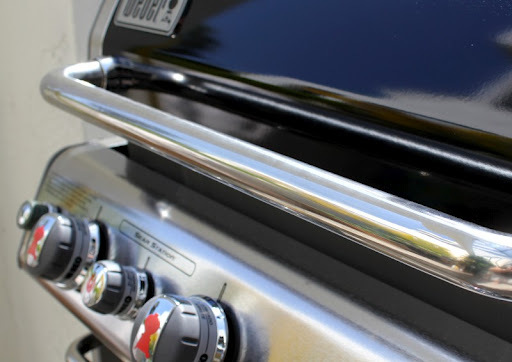 After some shopping around, we decided on the Weber Genesis E330. We wanted something that would last a long time and be easy to get parts/accessories for. The great reviews for the Genesis, along with how happy we've been with our Weber Smokey Mountain, made it a pretty easy decision. We had the new grill assembled and in use a few hours after it arrived. The inaugural grilling event was sausage and peppers. 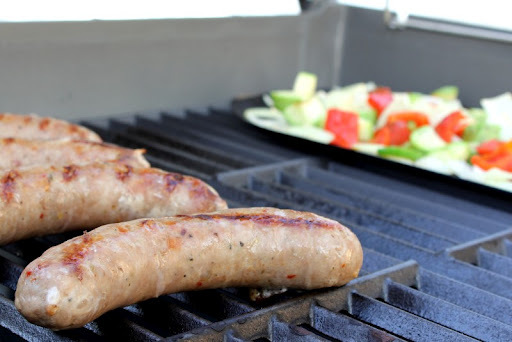 The sausages were Sicilian Sausages, from Rytek Kutas' "Great Sausage Recipes" - one of our favorites of the sausages we have made. 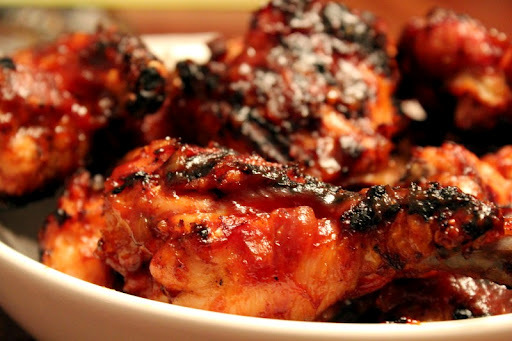 This grilled chicken with barbecue sauce is something I grew up with. I need to have it at least once a year. 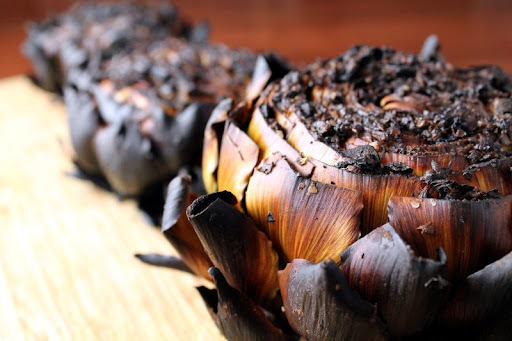 We weren't sure what to expect when we tried this recipe from Mario Batali's "Molto Italiano", but it has quickly become one of our favorite ways of cooking artichokes. The outside gets completely charred, but you don't eat that anyway. The bits of garlic and lemon that get pushed in between the petals get condensed down into bright, tangy bits of flavor. A simple staple in our house when the weather is warm. 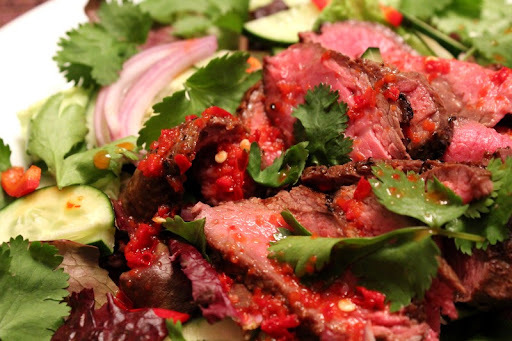 I never get tired of the blend of flavors and textures of grilled meat, chiles, fish sauce and crisp salad. 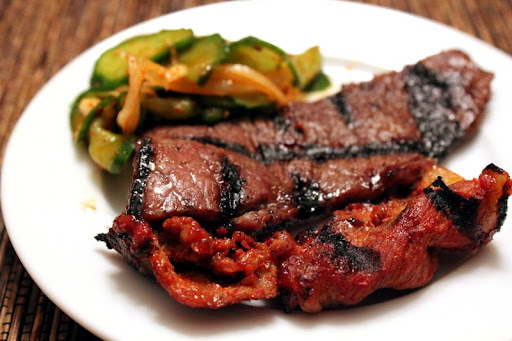 We wanted to make Cab Cooks' recipe for Korean Cucumber Salad (it is very good - you should try it), so we complemented it with some pre-marinated meat (boneless beef short rib and marinated pork collar) from Zion Market. 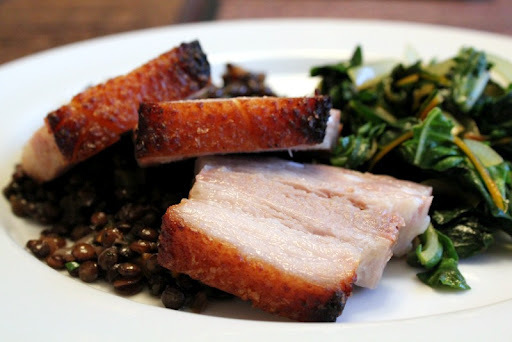 Roast pork belly isn't a typical dish to do on the grill, but we had some already brined (using the recipe from Fergus Henderson's "Nose To Tail") and our oven was on the fritz. We put the belly on a small sheet pan and used the grill like an oven. It worked great. In the short time we've had it, our new Weber grill has seen a lot of use and we couldn't be happier with it. We look forward to getting a lot of good years of grilling out of it.